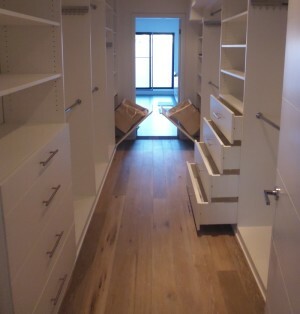 A walk in closet as the name implies is a room you walk into to access your clothes. Whether your walk in closet is a small or a large room, our design experts will help you design the best storage solution that will fit your needs. Having a closet, where you walk in and see all your clothes, shoes, accessories, visible all at the same time in a stylish and organized manner, will make an easy start to your day. Below are two walk in closet examples. First one being approximately 9 feet deep by 5 feet wide, configured in L-shape layout. The second closet, much larger, “a walk through” closet to an ensuite bathroom, which has left and right sides fully utilized. The below walk in closet is done in Woodline Creme wood panel finish, which is exclusive laminated panel imported from Europe and only available at Komandor. 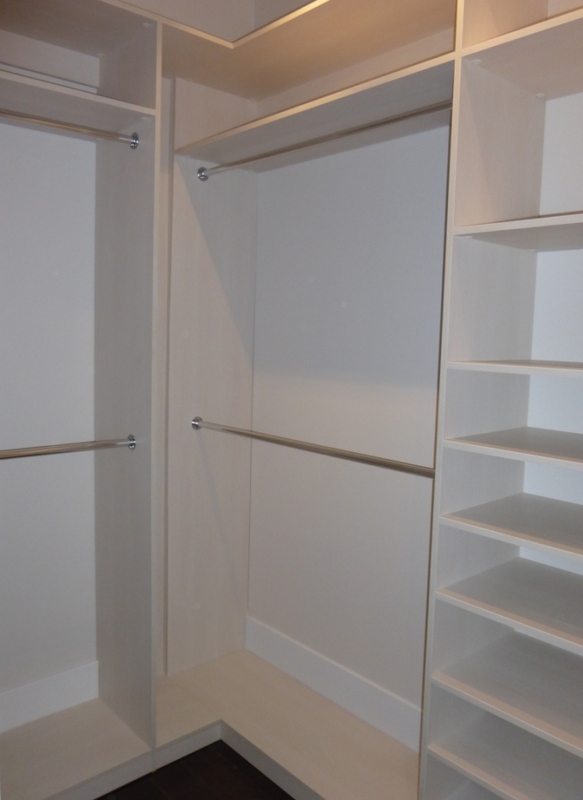 At Komandor Canada we custom build our closets and tailor them to the smallest detail; the gables are drilled for adjustable holes only where necessary; gables with hanging rods are not drilled, thus providing a clean, smooth finish. 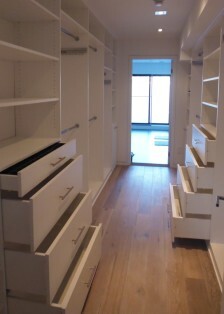 Cabinets are fully built-in with side fillers, toe kicks and custom handles. Available in two different wood thicknesses – 3/4″ (18mm ) and 1 1/4″ (28mm). Connection shelves that join two walls at the top and the bottom are custom fitted to have a smooth continuous use of the shelf. 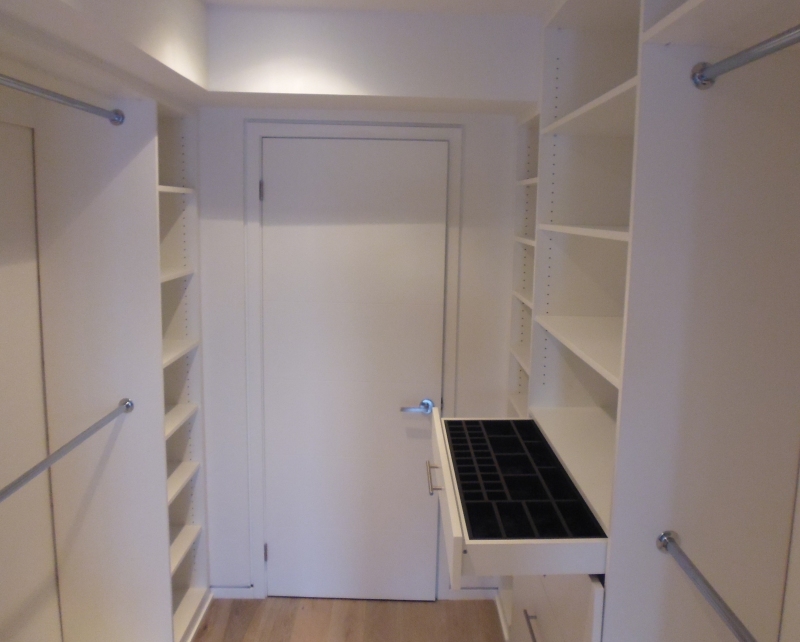 Shelves can be either adjustable or fixed depending on the customer needs. Hanging rods are made from steel with chrome finish, 1″ diameter prevents the rods from sagging over time. 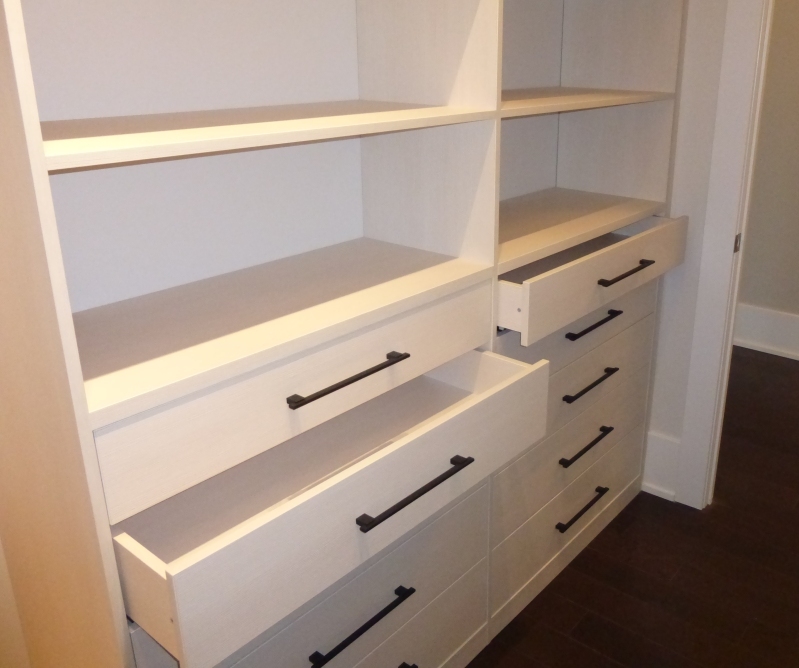 Drawer boxes are made with same 3/4″ thick Woodline Creme panel matching to the rest of the cabinetry. Bottom pieces ( which are 3/4″ thick) of the drawers are grooved into the sides of the boxes, which provides very strong and long lasting drawer. Below, the drawers have under mount full extension sliders with a soft-close option, thus as you pull out the drawer, you don’t see any ugly sliders. 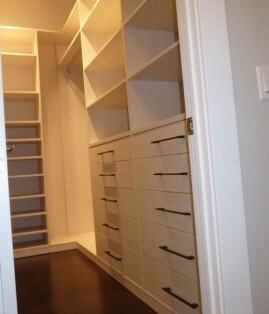 This second walk in closet is a “walk through” bedroom closet to a bathroom. 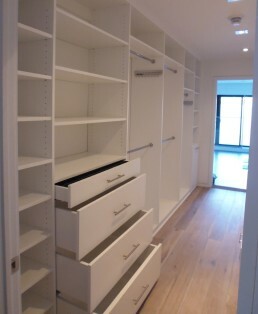 With this type of closet configuration, it’s easy and good idea to separate “his” section from “her” section of the closet. Thus, providing easy and quick access to the clothes for the couple at the same time. The height of the side gables were custom cut to have exact fit, floor to ceiling. 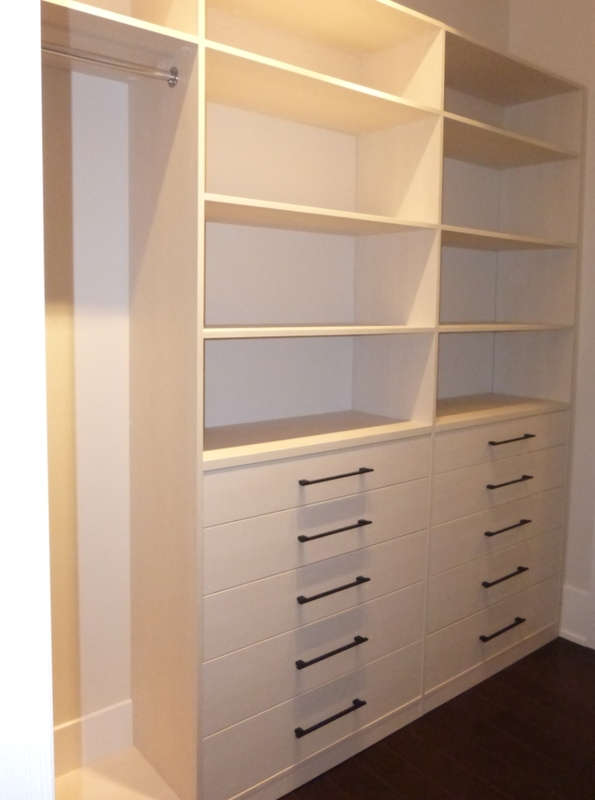 Finished in White Aspen wood grain finish, matching the white painted walls, makes this closet spacious and open. The laundry hamper has tilt down door with a chrome basket which is removable, and the cloth bag is removable as well. Side gables are pre-drilled only for adjustable shelves, and not where the fixed hanging bars are, which makes the closet fully custom made. Accessories in this closet such as pull out chrome belt racks, tie racks and custom jewellery drawer inserts made the closet truly special, just like icing on the cake. At Komandor Closets, we’re proud to create such custom walk in closets that make our clients enjoy their closets for long time. Bringing to life the closet that is now functional, professionally designed and optimized and last, but not the least – A Beautiful stylish closet that will make you love your clothes back. 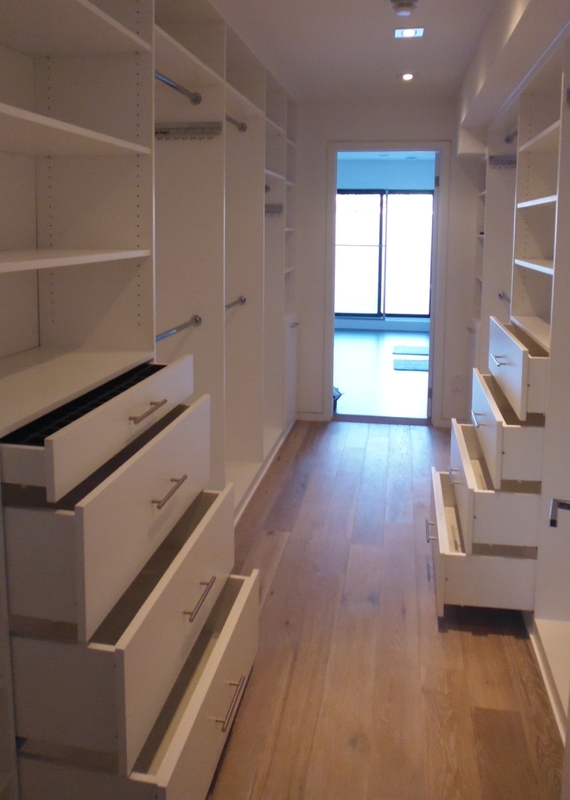 Let our design experts help you create your next dream walk in closet. Call us @ 416-251-1880 or send us a message, and we’ll be glad to assist.